THIS short, easy, and step-by-step tutorial will teach you how to transfer files with FileZilla, the free FTP client. More precisely, I am going to show you how to install FileZilla into your computer, how to connect with FileZilla, and how to transfer files with FileZilla. Also, you will learn how to download and how to upload files with FileZilla. It is true that most of the things (or problems) you can solve through your site’s WordPress dashboard. However, sometimes you just need to have access to the actual files of your website. These are the times when you need to use some FTP (File Transfer Protocol) client to create a connection to the server. That’s where FileZilla comes into play. It creates a connection between your computer and the remote server where the actual files of your website locate. It is a little bit similar to the contemporary cloud system, where files are sitting somewhere on a server and you have no idea where on Earth they physically locate. The physical location is not important, though. All you need is to have access to these files (wherever they are). And that’s just exactly what FileZilla does. 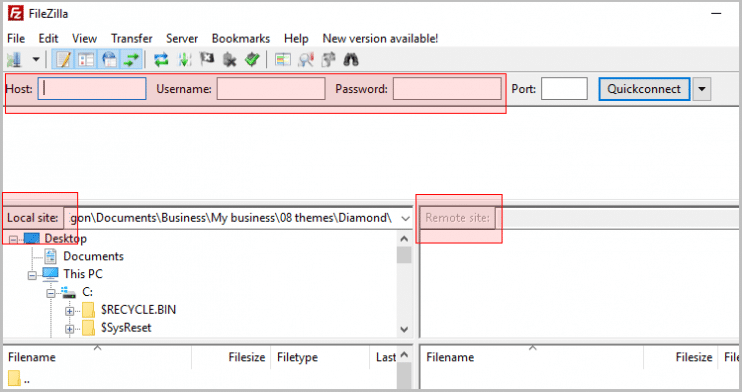 Once you give FileZilla your access details, it will connect you to the right server, and you will see your files. Keep reading and I show you exactly how to do it. As you see, the Filezilla Client is the way to go if transferring files (uploading or downloading them) is your intention. Filezilla Server is a tool for making files available for others (uploading for others to download). Download FileZilla free FTP solution here (client). Download FileZilla FTP Server here. As you also see, the FileZilla Client is available for all platforms (32 bit Windows, 64 bit Windows, Mac Os X, and Linux). FileZilla Server is only for 32 and 64 bit Windows. In this tutorial, though, my aim is to show how to transfer files with Filezilla. Therefore, I am not going to touch the Filezilla Server here. Well, now, what you want to do is hit “Download FileZilla Client” and download it to your computer. After that, install the FileZilla free FTP solution. On top of the FileZilla dashboard and right under the menu bars you see four empty text boxes. These text boxes are here so that you can give FileZilla access details to your site. Left side – Local site – This is the file system of your local computer. Right side – Remote site – It’s empty at the moment. 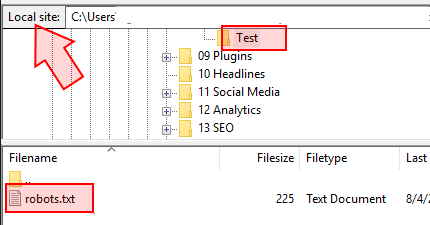 However, after FileZilla connects you to the server, the remote files (the actual files) of your website will show up here. Port – leave it as it is. Hey! What username? What password? That might be quite a puzzle, right? Your Gmail username and password don’t apparently work. So what should you write here? Therefore, log in to your hosting service’s dashboard and get FTP access details to your website. After filling the text boxes host, username, and password hit Quickconnect beside them. The window on the left shows you the files of your computer. The window on the right lists the files of your website (remote files on the server). Do you see the files on the right? If so, great. You are connected. If not, then probably something went wrong. For some reason, the FTP client failed to connect you. In this case, try again. 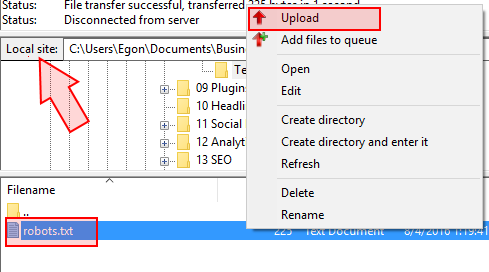 Now that you have created connections with the server you can start transferring files with FileZilla. Fortunately, that’s really easy to do. You can download with FileZilla. And you can upload with FileZilla. First, on the left-hand side (local site) navigate to the folder where a download is saved. Second, on the right-hand side (remote site) navigate to the file you want to download. Let’s say I want to download Robots.txt file from the server. 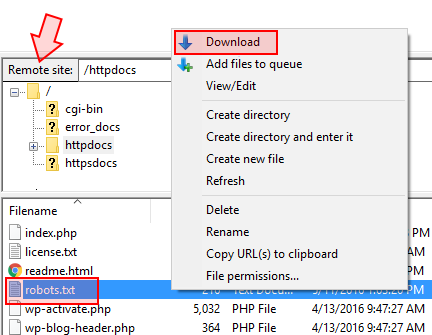 As you see, the file locates in the httpdocs folder. The robots.txt file on the remote server. The same robots.txt file downloaded to the local hard drive. Uploading from the local computer to the server is pretty much opposite to downloading files. 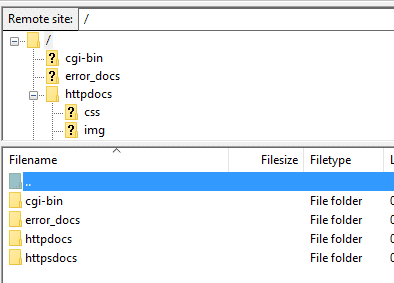 On the left-hand side (local site) navigate to the folder where the file (or files) locate. On the right-hand side (remote server) navigate to a folder where an upload will be saved. If FileZilla does not encounter any errors, you file (or files) will be uploaded to the server. After you have transferred all the files disconnect using “Disconnect” button on the FileZilla menu at the top. Create my own WordPress blog in less than 5 minutes (video). Do you want to learn how to start your own internet marketing business from scratch? Yes, I want to learn how to make legit income online. Free and no obligations! Blank Web Page Template in WordPress – How to Make It? How to Use a Free Website Button Generator to Create Hover Buttons? 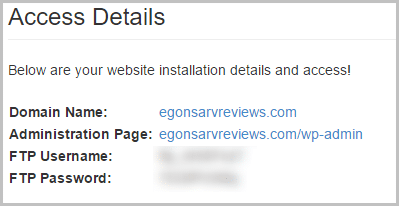 How to Make a Gravatar?